Many environmental factors contribute to the lifespan of your fine art print. You want your Hymnscript artwork to be enjoyed for years to come, so you should display it in a safe environment. Here are some of the factors you should consider. Light, both natural sunlight and artificial light, will damage paper and most types of art media. Light damage is cumulative and irreversible. Do not hang art where it will be exposed to prolonged daylight or direct sunlight. Even artwork framed under UV-filtering glazing should be kept from direct or excessive sunlight; UV filtration does not eliminate the damage caused by visible light. Close window curtains when a room is not in use. Or consider using a window film that filters light and UV rays. Rotate your artwork occasionally to limit its exposure to light, or remove it to a safe storage area for a while. Fluorescent and metal halogen lamps also emit high amounts of UV light and should be used as little as possible near valuable artwork. Ordinary household bulbs (incandescent or tungsten) contain negligible UV rays. They do, however, give off heat, so they should not be placed close to the artwork. There are many good options available for lighting your artwork. Track lighting with a dimmer control is a good way to showcase your artwork. Low voltage MR-16 Halogen spot bulbs with glass UV filters are often recommended. There are many factors involved in determining the right light to use in your art “gallery.” A lighting consultant can help you determine which lighting to use, how much you will need, and how to install it. 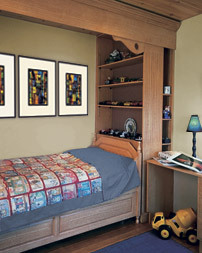 A stable, cool, dry environment is the best place to display your fine art print. A well-designed mat-and-frame package will provide some protection against day-to-day fluctuations in temperature and humidity, but seasonal and long-term changes can cause problems. As a general rule, your artwork should be in an area with a temperature around 70 degrees Fahrenheit and relative humidity of around 60 percent. Keep your print away from basements, attics, bathrooms, or any other places subject to extremes in humidity or water leakage. Hang your artwork on an inside wall. If it is to be hung on an outside wall, be sure to include a moisture barrier layer in your frame. Moisture from evaporative coolers (“swamp coolers”) and vaporizers can damage your fine art print. Remove artwork from areas that are being painted, carpets cleaned, or wallpaper removed, and wait until the area is completely dry before rehanging the art. Keep your print away from sources of heat, such as working fireplaces, radiators, or other devices. Making sure your artwork is framed correctly is the best and easiest way to protect it from air pollutants. Hang your artwork in area free of dust and soot, smoke, burning wood, paint fumes, cleaning solvents, car exhaust, smog, rubber-based products, and ocean air. Kitchens and bathrooms are not environmentally friendly places to display fine art. Insects can eat, soil and damage paper. Check periodically to see if any have invaded your framed artwork. Immediately remove any you find and check for any others in the area. Securely attach all framed artwork to your walls, whether it’s a family photograph or a work of fine art. Discuss available picture-hanging materials with your framer to find out which types will best support your artwork. If your fine art print is damaged by water, consult a professional framer or paper conservator for help. Depending on the amount of damage, your print may not be salvageable.